The most up-to-date version of this article (from March 2016) can be found here. Today I will discuss how you can travel overnight by train from Tokyo to the northern part of Japan, including the island of Hokkaido. This is an extension to my general article about traveling overnight by train in Japan, which I am happy to say is my most popular article to date on this blog. It seems, from my observations, that there are two very popular ways of traversing this route: you either fly, or you take an overnight train. Believe it or not, despite the fact that the air corridor between Tokyo and northern Japan is among the busiest in the world, many Japanese choose to make the overnight journey by train: You can travel via rail from city center to city center, you don’t have to worry about security or baggage checks, and you can kill two birds with one stone as your journey doubles as lodging. Of course, it is possible to make an entire day out of traveling to northern Japan by rail. The shinkansen, or bullet train line, is inching its way up at a steady pace. Several months ago, the line was extended north from Hachinohe to Aomori. With two connections, for example, you can leave Tokyo at 9:00 in the morning and arrive in Sapporo by about 6:30 in the evening. But the journey is expensive, and if you’re a tourist, you might want to look for another option. Your goal is to spend as much time as possible exploring the country. While some may claim that you are experiencing the country when riding on the train, for the most part all you do is remain seated. Overnight train services are an excellent option. There are 2 or 3 nighttime services that run from Tokyo to northern Japan every day, all leaving from Ueno station. Every day the Hokutosei runs to Sapporo, and the Akebono to Aomori, using Japan’s iconic (and aging) “blue car” sleeper units. On alternating days, the more modern (and more expensive) Cassiopeia takes to the Ueno-Sapporo route. What a magical journey, letting the rails lull you to sleep and then waking up, refreshed for your new day and your new surroundings. The website jprail.com, which I have referenced before, has several excellent articles about the overnight trains in Japan. I highly recommend that you take a look at all of his articles and descriptions. The overnight trains in Japan vary by cost, but have one significant drawback: they tend to get so popular to the point that you might not be able to book the train that you want. Tickets for these overnight trains can only be purchased inside Japan, and when you land in Japan and attempt to make a reservation, you might not get the type of accomodation you want on the train, or worse, you might not get to ride the train at all. The dates show when the Cassiopeia runs from Tokyo to Sapporo, and back to Tokyo. 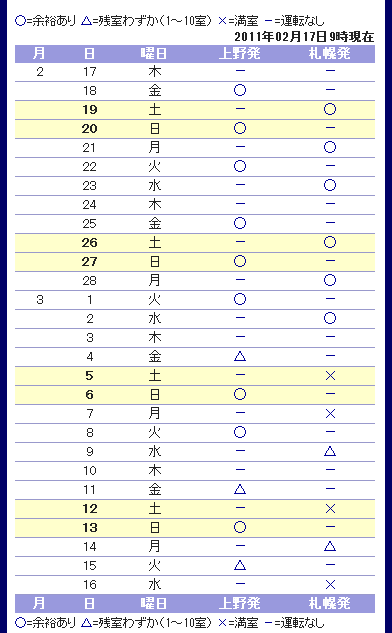 The first column of X’s, O’s and Triangles shows availability for trains departing Ueno, and the second column shows trains departing Sapporo. you’ve gotten me really excited about my trip!